It seems that most people have a collection of loose change somewhere…in the car, a jar in the kitchen, etc. Have you thought about using it as a teaching tool? Here are a few examples what you could do. Label– Talk about the names of the coins. Describe the coin. How does it look, feel, compare to the other coins, etc. Sort – You can use a snack size plastic bag, cups or bowls. Write the name of each coin on the bag or on a card in front of the cup or bowl. Then pour out some of the change for your child to sort. *Nickels and quarters tend to be easily confused. I like to point out that nickels have a smooth edge, but quarters have ridges on the side. Amounts/What’s it worth? – How much is a penny worth? 1 cent. A nickel is worth 5 cents…which is 5 pennies. A dime is worth 10 cents…which is 10 pennies OR 2 nickels. A quarter is worth 25 cents…which is 25 pennies OR 5 nickels OR 2 dimes and 1 nickel. *Keep the conversation on your child’s level. There is nothing wrong with exposing new concepts to your child, but it’s not fair to expect a 4 year old to understand that 2 nickels and a dime are the same as 1 quarter. 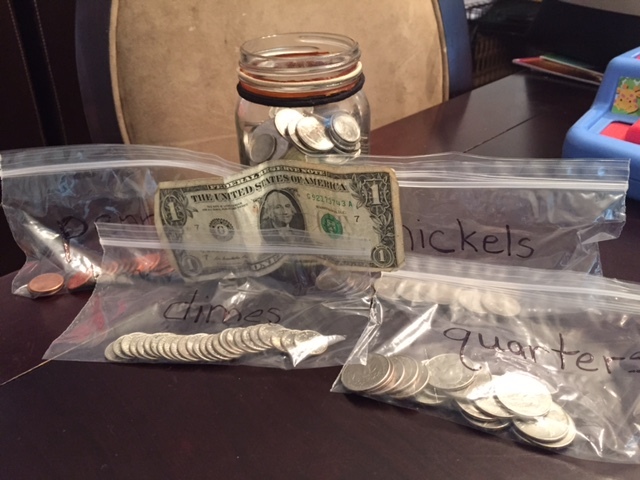 Show the amount in different ways – How many different ways could you make 10 cents? 25 cents? 37 cents? Show the amount with the least number of coins – How can we make 30 cents using the least number of coins? Exchange – 100 cents equals a dollar. If you can give me 100 cents, I will exchange it for a one dollar bill because it is worth the same amount. Then move on to larger bills when ready. These are just a few ideas. How do you teach your child about money?